One of the most popular attractions at SoWa is the roster of rotating food trucks that border the entrance. During peak hours, lines are long, and open seats are sparse, but this adds to the appeal. The names of the trucks that will be appearing on a given Sunday are conveniently posted on the SoWa Facebook page on Saturday for those of us who come to eat. I had heard about Silk Road BBQ for the first time a couple of years ago on Chronicle and had wanted to visit for a while. Yup, I have the TV-viewing tendencies of a 70-year-old, but the show gives me the local warm and fuzzies. 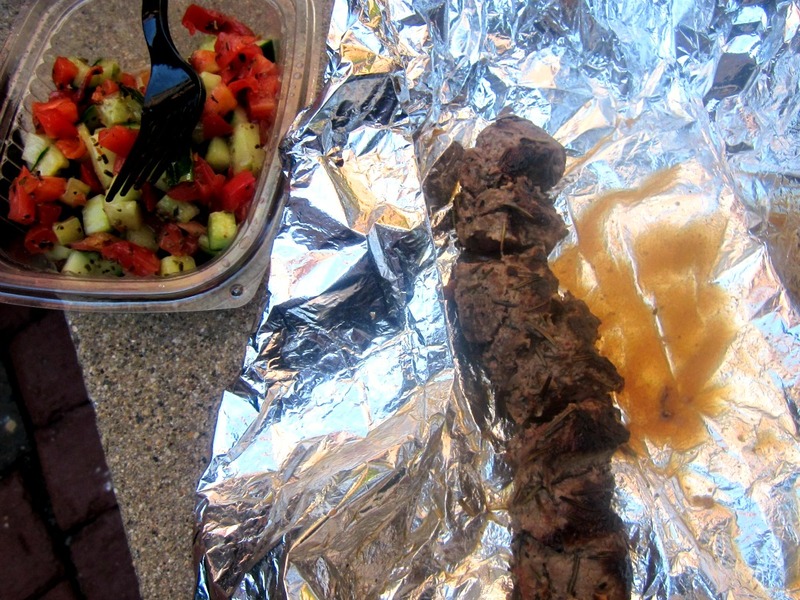 Silk Road is not quite a truck, but a transportable stand, and the friendly guys who own it serve up a small menu featuring bites from Russia to Jamaica, with a focus on central Asian “Shashleek,” or skewers, grilled-to-order over an open flame located outside the small stand. I find their approach to feeding the masses to be so genuine and authentic: here’s some properly marinated meat on a stick which I’m going to grill for you, and only you, while you watch. Isn’t that the essence of community? There’s no flashy truck, no big logo, just good food. Talk about warm and fuzzies. You can imagine how surprised I was to see that Silk Road was the only outpost without a line. While Speed’s and Kickass Cupcakes (I can think of another name for these tasteless confections) had lines of customers spiralling around the grounds, Silk Road had one or two customers. But before I dashed to Clover to grab a chickpea fritter instead, I stood a minute to watch these guys work, while the smell of charcoal wafted through the air. I went ahead and ordered the Uzbek Leg of Lamb Shashleek, marinated with some of my favorite flavors (onion, mint, and rosemary) and the Mediterranean Salad of diced cucumber and tomatoes, dressed with lemon and olive oil. The cubes of lamb were beautifully prepared with a salty and flavorful, charred crust. Although cooked a little longer than I would request, the lamb was still incredibly moist, tender, and juicy at its standard 8-minute grilling time. This is reminiscent of the simple food I like to prepare on the grill at home. I missed the chopped red onion that I grew up eating in Middle Eastern salads, but thought the ratio of oil to lemon was perfect in this version. The bright salad was the perfect side for the rich meat. This isn’t you average open market fare, and I’m so happy I didn’t follow the crowd. 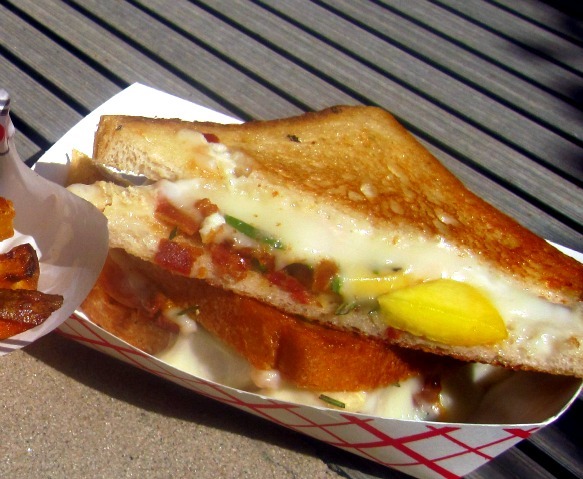 I also got to taste a few offerings from the Roxy’s Gourmet Grilled Cheese truck. I wasn’t sure what to expect. I believe that gooey goodness cannot be achieved by just anyone. There has been a lot of hype surrounding this truck, amplified by its stint on the Food Network’s Great Food Truck Race. I fear that everything the Food Network touches turns to green, while its quality diminishes, if you know what I mean. It’s the “Food Network effect.” Lo and behold, the food was wrapped in wax paper peppered with the Food Network logo. But, I have to admit, the bite I had of the special of the day was pretty perfect. This sandwich was grilled golden and not overstuffed with a creative-but-not-crazy filling of peaches, crisp bacon, rosemary, and Taleggio, one of my favorite melting cheeses. The peaches were not overly ripe, so no sticky juices interfered with the molten cheese. 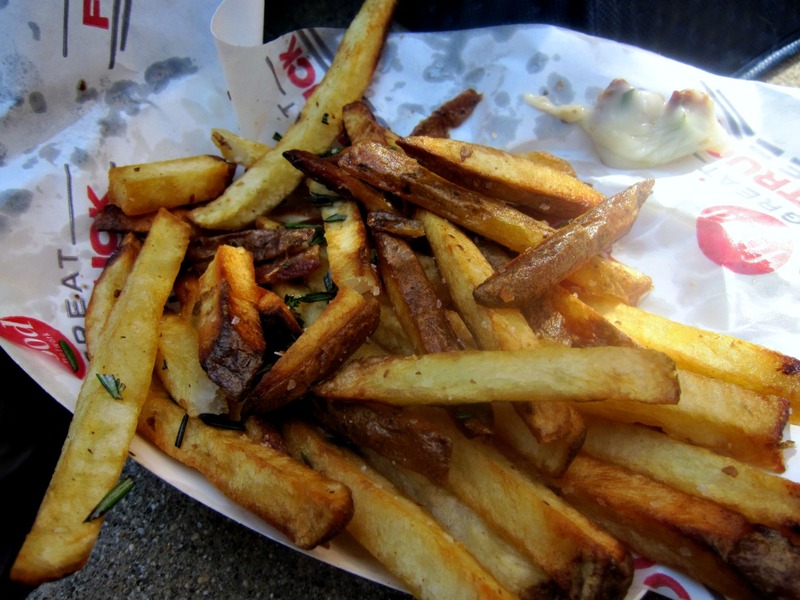 The truffle fries, though, were limp and lackluster. Truffles are delightfully rich, but I think truffle oil is overused. That doesn’t mean that I wasn’t disappointed when not a hint could be detected on the fries, which were hot and nicely seasoned with rosemary and kosher salt, but devoid of any crisp or crunch. If I’m eating fried food, I want it to taste, well, fried. All in all, though, the truck with the little girl and the big tattoo didn’t completely underwhelm. Unfortunately, I left the farmer’s market empty-handed; the baked goods, even those from my beloved Danish Pastry House, were turning into melting pools of butter from the strong September sun, and the fruits and veggies looked less than prime, most likely due to the Summer-Fall transition. But a stroll through tables of tempting goodies is always welcomed. Featuring good finds, both edible and not, SoWa is the perfect place to spend a Sunday. Fall weather is most definitely fair weather. And, doesn’t this event just look awesome? I love going to SOWA. I tried the pork BBQ at Silk Road too and was pretty impressed! Fall is my favorite season! I’ve never been to SoWa. I never seem to have time to trek over there on a Sunday, but I’ll do it one of these weeks! That grilled cheese combo sounds so interesting.